Stock photo of the Reversing Falls along the Saint John River in Saint John, Bay of Fundy, Fundy Coastal Drive, Highway 1, New Brunswick, Canada. The amusing foamy swirls of the Reversing Falls flow to the Saint John River by the town of St John. 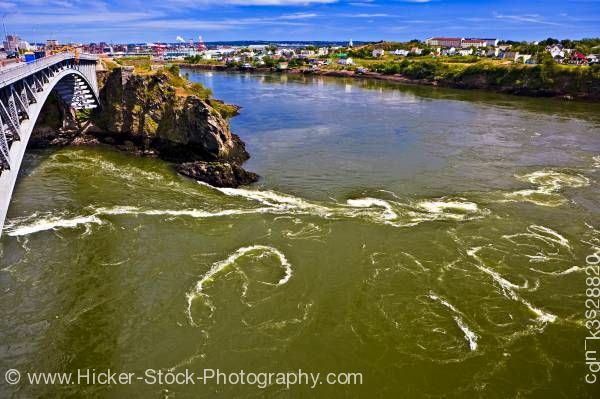 This stock photo shows the amusing flow of the Reversing Falls swirls along the Saint John River by the town of Saint John, Bay of Fundy, Fundy Coastal Drive, Highway 1, New Brunswick, Canada. The green waters of the Reversing Falls with its foamy white swirls flows down into the deep blue waters of the St John River. Spanning the interesting falls is an under truss gray metal bridge leading to a rocky ledge overlooking the river. In the distance, an amazing bright blue sky and soft clouds reveal a gorgeous day in the beautiful town of St John that sits close to the shoreline of the St John River. A soft reflection of the town is seen on the river’s edge.